A Hawaiian newspaper sacked a journalist last week after an investigation found he had copied passages from Wikipedia. 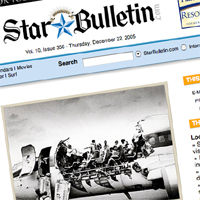 The Honolulu Star-Bulletin dismissed entertainment reporter Tim Ryan for plagiarising content in six stories written since April 2001. Wikipedia editors were first alerted to Mr Ryan's work during analysis of a feature he wrote on a Hawaiian airline disaster. Contributors flagged up their discovery in one of Wikipedia's 'signpost' entries and an investigation at the newspaper followed. In a message to readers, editor Frank Bridgewater said the stories did not contain inaccurate information but used phrases copied from the online encyclopedia. Most of the stories have since had correction notes added. Many in the traditional media do not consider Wikipedia to be a reliable source of information but a recent study found its standards of accuracy to be comparable with Encyclopedia Brittanica. NYT uses data visualisation to bring climate change home. Literally.